Fortune Sancte Keyne, currently Princess of Tir Mara. Served until November 2018 as Chatelaine of the Shire of Quintavia. 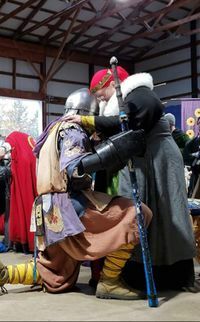 As of October 2015 I became a protege to Master Dorio of the Oaks, Baron Stonemarche. Despite his passing in July 2018 he will always be my Pelican. As of October 2017 I became an apprentice to Mistress Elizabeth Elenore Lovell. I was released from fealty upon my becoming Princess. A Venetian courtesan with a Welsh name. The daughter of an Italian noblewoman and a Welsh fabric merchant, raised in Venice with her mother's family when her parents passed away when she was young. Having a noblewoman's education and skills, but not quite the position due to her father's dealing in trade and decidedly not suited for the cloistered life of the nunnery, Fortune found the best position for her was as one of Venice's famous courtesans. As a cortigiana onesti, or honest courtesan, she hosts fabulous parties and holds salons for artists, poets, and politicians. Fortune is widowed, probably, it has been some time since we've seen what's-his-name. He lived on the mainland anyway. She also spends much of her time educating others, and mentoring other young ladies who might follow the courtesan path. Autocrat Spring Coronation 2016 - 667 attendees! This page was last edited on 17 December 2018, at 02:09.